Samuel Clemens | Write to the Point! There is quite a difference between a bit of deadpan humor and nearly four hours of monotony. While director Ken Burns’s works are often described in reviews as “fascinating” and “vivid,” those critics are just not critical enough when it comes to Mark Twain: A Film Directed By Ken Burns. Certainly a subject such as America’s greatest writer can capture the audience’s attention – but if this is the case, what was it that had half the audience asleep? The problem certainly didn’t lie in the subject matter. There has perhaps never lived a more interesting individual than Mark Twain, and a biographical documentary on Twain should certainly interest the young journalists who made up the audience. But the execution of the video left much to be desired. Be it the repetitive musical score, the emotionless voice of narration or the unappealing photography, the many insufficient elements of production offer a wide variety of choices to blame for the film’s failure. I may be considered too harsh, but Twain himself, ever the cynic, may even have found enjoyment in pointing out the production’s flaws. Of all writers in America’s brief history, none stand as tall as a literary giant as Samuel Clemens, who went by the moniker of Mark Twain. Twain, the defining author of American literature, is probably also its most prolific. The depiction in the documentary Mark Twain: a film directed by Ken Burns, is true to what I’d heard. The level of detail to which the featurette descends makes him a bit of an inspiration. I see in Twain the one trait all successful writers must have, an almost instinctual one. It is the characteristic of keeping it raw. When writing a work of either fiction or nonfiction, nothing must be held back. It is necessary that it be dark, scathing, caustic; it has to be something old done from a different perspective, or something new entirely. It mustn’t conform, and preferably should make those who are rigid and conservative loathe it, or something close. Just far enough outside the box that someone reads it, but not too far that it doesn’t sell. If a devout Catholic, or an otherwise religious person, can read it and not be offended, then it’s a bit weak. If you’re reporting a story that the government doesn’t want in the public eye, and then balk due to controversy, then you’re either a sheep, or in their employ. If your parents can read it and wholeheartedly agree with it, then you’ve lost the spark. Maybe the reason I believe these things to be true can be attributed to my youth, but it doesn’t make it any less true. And I’ve a feeling that Twain would agree. 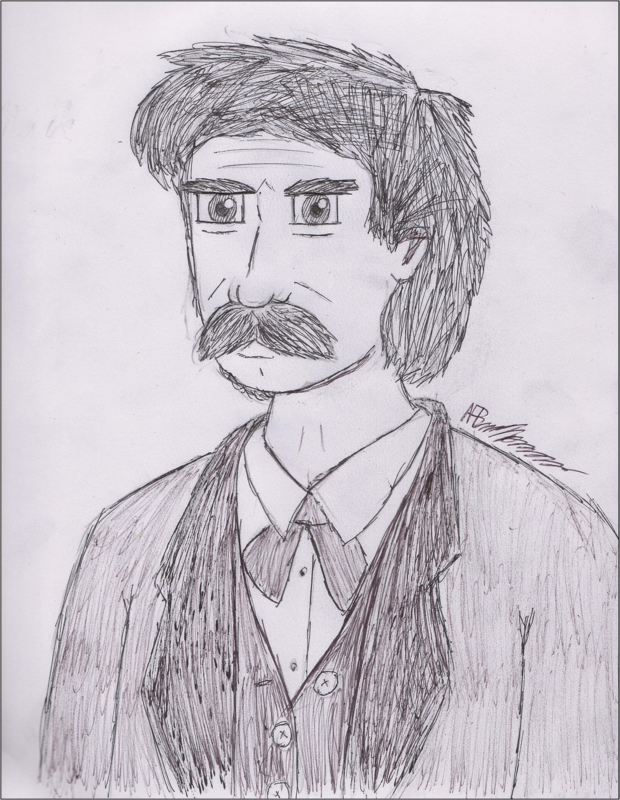 Recently I watched a documentary about the life of a man named Samuel Clemens. But the name isn’t important. What’s important is the man belonging to the name, and how he’s just as much of a human as anyone else on the planet with that kind of name. A name is a label that’s a be-all description of any being, human or otherwise, from birth to death. You’ll never be able to read the full description, at least not all at once, because people change moods during their lifetime. And Samuel Clemens was a man who was constantly changing. He was born a poor boy in the town of Florida, Missouri, grew up a troublemaking brat in Hannibal, sailed up and down the Mississippi River as a young man, became a sensational writer in Nevada during the Civil War, became a family man and America’s sweetheart afterwards, and a frivolous man and America’s enemy after that, before dying an old man, once again a sweetheart, but not the same as before. And what can you say about a dead man that hasn’t already been said, or thought at least once? Some could say nothing printworthy, but damn it all if I’m going to let that stop me. Mark Twain described himself once as the perfect man. He was far from perfect, but he wasn’t saying he was. He meant that he was instead the epitome of what it means to be human. What it’s like to be happy, what it’s like to be sad, what it’s like to be rich, what it’s like to be poor, what it’s like to love, what it’s like to hate, and overall what it is to live and die. It’s a long story that’s not for the faint of heart. It involves death, depression, racism, hypocrisy, murder and torment. But that’s all part of life. Twain was a man who made himself great. But before that, he was just like anyone else: born an idiot with no idea what was going on. I myself was born an idiot, I have lived life as an idiot, and shall continue to be one until I learn all there is for me to learn. And then I will die. It’s a fact of life. Just like Twain, there will be hardships in my life and I shall have to move past them and learn from the experience. Everyone falls at the same speed, but our strength is defined by how fast we are able to get up again. Luckily for me, I’ve been able to get up pretty damn fast so far, and I hope to whoever is up there watching over me, that I’ll still be able to get up when I’m older. I have a strong appreciation for people who fail often before becoming successful. This appreciation stems from not only an admiration of the ability of individuals to pull themselves back up after getting knocked down, but also from a desire to know that even if I fail, I am not necessarily a failure. I don’t consider Samuel Clemens to be a failure, and I have a feeling that most other people don’t as well, so in the Ken Burns documentary Mark Twain, it was very refreshing to see him fail and constantly try new things before becoming an established author and personality. However, I couldn’t help but wonder what Clemens would have been like had he been born a girl. There’s no doubt that he wouldn’t have been taken seriously as a newspaper reporter, miner, or steamboat captain, but he would have also probably had fewer opportunities to try and fail. The crass wit which made him famous would have never been accepted by society. Nonetheless, I allowed myself to be inspired by his story. Clemens’ personal path allowed him to become personally acquainted with all types of human nature, and he turned the characters he met in his travels into characters in books. I appreciate that Clemens was aware of the hypocrisy that came with maintaining two identities, although I don’t condone the hypocrisy itself. He wanted to be rustic and take down the mighty, yet he also wanted to be the mighty; he criticized those who were obsessed with material goods and get-rich-quick schemes, and yet he spent $30,000 a year on his home while the average American brought home $500 in a yearly salary. There is no doubt that Clemens was imperfect, but the fact that he seemed well-aware of his imperfections and dealt with a great deal of self-loathing makes him seem much more human. Before watching the documentary, I never knew how much he hated giving comedic lectures. I never knew that he sat alone in the dark for hours before going on stage to perform, or that he tried to kill himself. These flaws make him all the more interesting and relatable as a personality, and I feel that his self-awareness opens him up to more sympathy from others. I understand that he represented a variety of human experiences within his own set of alter-egos, but at the same time, he can’t claim that he knows what it means to be a poor black woman, or a Native American, or a European immigrant, so it seems overly rash and uncharacteristic for him to claim there is one American. With that said, the documentary gave me a stronger appreciation and awareness of the importance of The Adventures of Huckleberry Finn. I read the book in ninth grade English class, I wrote a research paper on censorship, and I loved it. But I didn’t realize how revolutionary the representations of racial relations in the novel were. It’s been a while since I’ve read The Adventures of Tom Sawyer, but I think the existence of “Huck Finn” makes “Tom Sawyer” so frustrating. “Huck Finn” might be to “Tom Sawyer” what the crash was to the roaring ‘20s. It was the “bye, bye” to the American pie. It kicks ignorant innocence in the face, and I love that. It’s strange to think that the man who wrote “Huck Finn” also wrote “Tom Sawyer” with wavering intentions of writing a sequel. Without “Huck Finn,” Mark Twain might be seen nowadays as a liar, or as a “whitewasher,” if you will, of southern history. Typically, I loathe being instructed by “literary experts” with regards to how I should feel about novels which I am perfectly capable of reading myself, but I have a much greater respect for the approach Twain took to writing “Huck Finn,” as well as for the voices he gave his characters, after I watched the documentary. While the documentary may have been long, and some of the literary experts interviewed liked the sound of their own voices a bit too much, it was definitely worthwhile for the nuggets of enlightenment they provided. The works of Mark Twain, especially Huckleberry Finn, have intrigued and impressed me throughout my education. So I was surprised t o find in Ken Burns’ documentary Mark Twain that the life of this American literary and comedic giant was marred by such tragedy. How could this man approach writing and society with such a wicked and irrepressible sense of humor after bankruptcy and the loss of a younger brother, two children, and eventually his wife? How could he have remained such a source of entertainment and joy for family and friends and for the nation when his personal and business affairs were a shambles? How could he have continued serving in this fashion while holding himself fully responsible for the horrors befalling him, his family, and his country? His experiences seemed to have given him an incredibly tough skin. Twain’s idiosyncratic writing style has always struck me, but after watching the documentary, I am even more deeply moved by the extent of his personal resilience and determination. I can just about verify that I would hardly be motivated to continue forward if I were in such a position as he found himself in his middle age. The idea that one can extract a sense of humor, not from an optimistic outlook on the human experience, but from an understanding that people need cheer in an otherwise rather cheerless world, moves me as a writer and as a human being, particularly because I am conscious of my own daily quest for happiness. Reflecting on what I have seen, I can claim neither happiness nor unhappiness to have been Samuel Clemens’s lot. But when Samuel Clemens grew cold and lost hope, his ability to withstand the winter by seeking solace in the eternal summer of Mark Twain – a personality which he regarded as his job – fills me with perhaps more awe than the ability of his writing to withstand the test of time.